Sheikh Mohammed bin Zayed Al Nahyan His Highness, Crown Prince of Abu Dhabi and Deputy Supreme Commander of the UAE Armed Forces, and Prince Muhammed bin Salman bin Abdul Aziz Saudi Crown Prince, Deputy Prime Minister and Minister of Defense, discovered the new ways of the more uniting relations between the two countries which brotherly and strongly ties across different domains. During the talk of Thursday after the arrival of the Saudi Crown Prince in Abu Dhabi on the visit of the state of Dubai. The leaders of the two states cooperate on the mutual understanding of the issues and robust foundation on common interest. They exchanged views over the current issues and threats which based the Middle East. Sheikh Mohammad bin Zayed said, "The UAE-Saudi relations are an exceptional role model for brotherly ties that go down to the annals of history. They are firmly based on mutual respect and joint determination to achieving the ambitions of their two peoples for sustainable development, social welfare, and economic well-being,"
Additionally, he said, that the two countries set an example for integrated relations and identical views on issues of common interest. "Relations between the two sisterly countries are steadily progressing and continue forging ahead thanks to the prudent vision of the President, His Highness Sheikh Khalifa bin Zayed Al Nahyan, and his brother the Custodian of the Two Holy Mosques, King Salman bin Abdul-Aziz Al Saud of Saudi Arabia." The Crown Prince of Abu Dhabi also added, "Our two nations are making large strategic strides to ensure the welfare and happiness of their peoples." 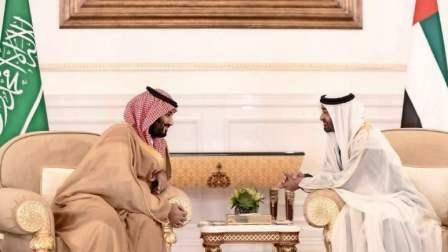 The Saudi-Emirati Coordination Council in May 2016 as a healthy steppingstone for significantly develop these relations across different areas, “The UAE-Saudi relations have witnessed a quantum leap that has been translated over the recent years into joint actions across all political, economic, cultural and defense fields,"
Sheikh Muhammad said, "The Kingdom of Saudi Arabia is assuming a pivotal role in efficiently confronting the challenges besetting the region and is spearheading the efforts aimed at ensuring security, stability, and development for the region's peoples, not to mention its good offices to achieve peace, and safety across different parts of the world,"
He wishes to Prince Muhammad want to continue between the two countries is the strong base about the prosperity and the welfare for the bright future of both states. They highlighted the strong partnership between both countries, primarily the danger and terrorism exist in the groups and undermine the stability of the region. Also addressing the regional issues and matters. Attending the talks between the two leaders were Sheikh Hamdan bin Zayed Al Nahyan, Ruler's Representative in Al Dhafra Region; Dr Amal Abdullah Al Qubaisi, Speaker of Federal National Council; Sheikh Tahnoon bin Mohammed Al Nahyan, Abu Dhabi Ruler's Representative in Al Ain Region; Sheikh Hazza bin Zayed Al Nahyan, Deputy Chairman of Abu Dhabi Executive Council; Lt-Gen Sheikh Saif bin Zayed Al Nahyan, Deputy Prime Minister and Minister of Interior; Sheikh Tahnoon bin Zayed Al Nahyan, National Security Adviser; Sheikh Mansour bin Zayed Al Nahyan, Deputy Prime Minister and Minister of Presidential Affairs; Sheikh Abdullah bin Zayed Al Nahyan, Minister of Foreign Affairs and International Cooperation; Dr Sheikh Sultan bin Khalifa Al Nahyan, Adviser to the UAE President; Sheikh Khalid bin Mohamed bin Zayed Al Nahyan, Deputy National Security Adviser; Sheikh Sultan bin Tahnoon Al Nahyan, Member of the Executive Council of Abu Dhabi; Sheikh Diab bin Tahnoon Al Nahyan; Sheikh Khalifa bin Tahnoon bin Mohammed Al Nahyan, Executive Director of the Martyrs Families' Affairs Office of the Abu Dhabi Crown Prince; Sheikh Shakhbout bin Nahyan Al Nahyan, UAE Ambassador to Saudi Arabia; ministers and other senior officials.